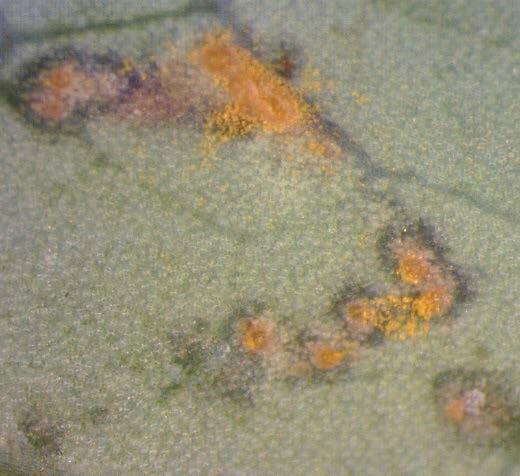 Leaf rust of blueberry is caused by the fungus Pucciniastrum vaccinia (synonym Naohidemyces vaccinia). The fungus has a wide host range including species of Vaccinium spp. (blueberry, cranberry, huckleberry), Tsuga (hemlock, spruce), and Rhododendron (azalea, rhododendrum). The disease has been reported in Asia, Argentina, Australia, Canada, Europe, Mexico and the United States. In Ohio, and other northern states, the disease is sporadic and localized. Leaf rust can cause premature defoliation of affected bushes. Over time, and if not properly managed, bushes slowly decline and produce fewer marketable berries. Figure 1. 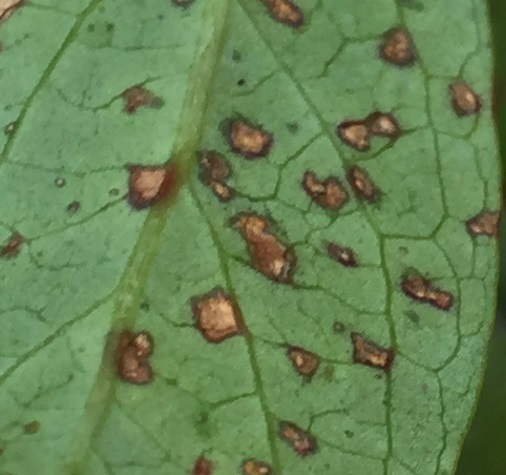 Leaf rust symptoms on blueberry. Mild temperatures (65 to 68 degrees F) and multiple days of rain are conducive to infection and disease development. 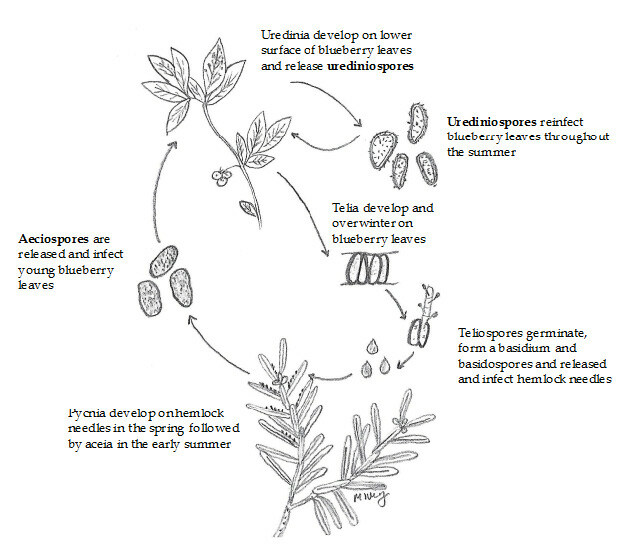 On blueberry, the rust fungus produces two spore types (urediniospores and teliospores). A third spore type (aeciospore) is produced on hemlocks (Tsuga sp. ), the alternate host for the fungus. In early spring or summer aeciospores are dispersed by wind and infect young blueberry leaves. The disease first appears as small yellow (chlorotic) spots on the upper surface of young blueberry leaves. As the infection progresses the spots turn a reddish-purple color with a discrete yellow halo (Figure 1). On the underside of the leaves, spots have a distinct brown edge with pustules of yellow-orange urediniospores in the center (Figure 2). These spores are capable of causing new infections throughout the growing season. Later in the season black teliospores form in the pustules. Teliospores then produce a final spore type, the basidiospore, and these spores are dispersed by the wind and infect hemlock needles. On hemlocks the fungus produces overwintering structures called pycnia, which release aeciospores in the spring starting the yearly disease cycle over again (Figure 3). Figure 2. Leaf rust spots on the underside of a blueberry leaf. Spots have a distinct brown edge (A) with pustules of yellow-orange urediniospores (B and C) in the center. Figure 3. 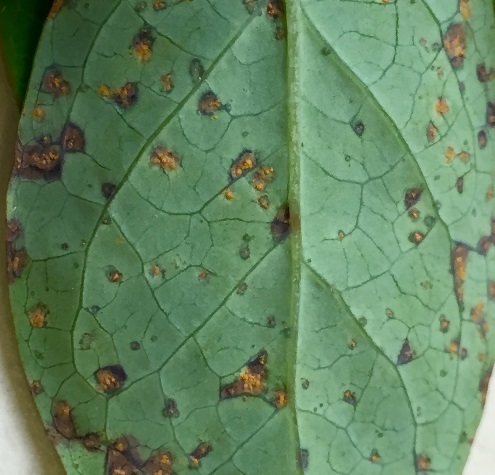 Blueberry leaf rust disease cycle. Aeciospores and urediniospores both infect blueberry resulting in disease. The best way to manage blueberry leaf rust is to plant resistant varieties. Popular varieties grown in Ohio with a high to moderate level of resistance to leaf rust include ‘Bluecrop’, ‘Burlington’, ‘Collins’, ‘Earliblue’, and ‘Weymouth’ (Table 1). 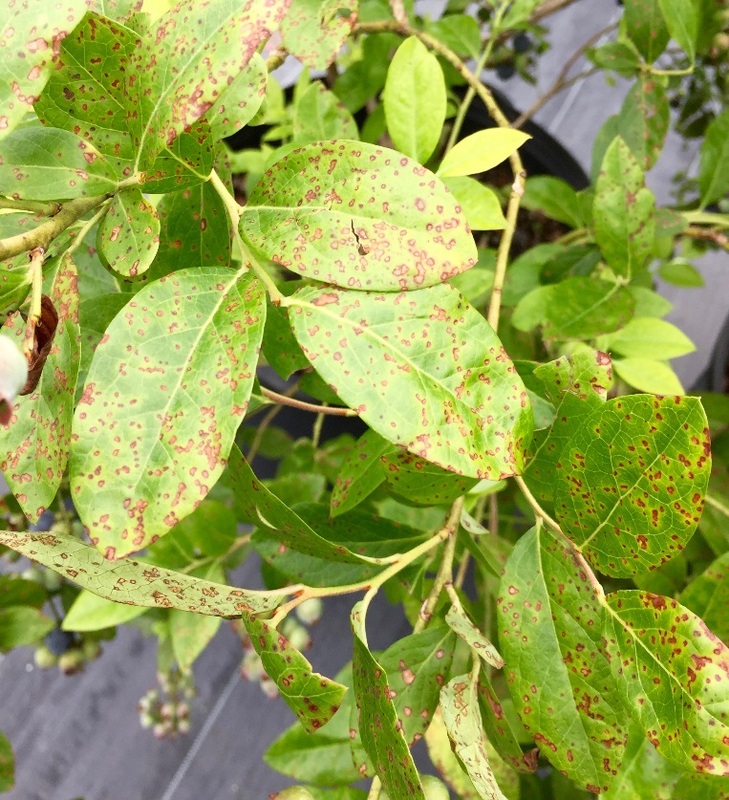 Because leaf rust is a minor disease of blueberry in Ohio, varieties with resistance to major diseases such as mummy berry (Monilinia vaccinia-corymbosi) and Phomopsis twig blight and canker (Phomopsis vaccinii) should be considered first in the selection process. The removal of hemlocks from surrounding blueberry plantings, especially those upwind of fields, will break the disease cycle of the rust fungus and significantly reduce the number of aeciospores available to infect young leaves in the spring. Yearly intensive fungicide spray programs specific to leaf rust are generally not needed in Ohio. If environmental conditions are very conducive for leaf rust fungicides can be applied when symptoms are first observed. Consult the Midwest Fruit Pest Management Guide (Bulletin 506) for current fungicide recommendations. This guide can be obtained from your county Extension office or the CFAES Publications online bookstore at estore.osu-extension.org. Table 1. Disease resistance in blueberry varieties commonly grown in Ohio. VR = very resistant; R = resistant; MR = moderately resistant; S = susceptible and — indicates that resistance is not known.